Who needs a wheat bun when you can have a smooth, buttery potato? This is another quick lunch idea that uses leftover chicken. Layer ingredients on a plate and enjoy! 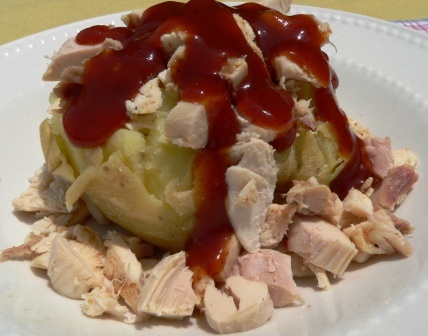 You may also enjoy Easy Pulled Barbecue Chicken and Taco Potato. Great idea! I’m always looking for baked potato toppings that don’t involve cheese or beef (both allergens here). Thanks for the tip!